anong modelo ito? 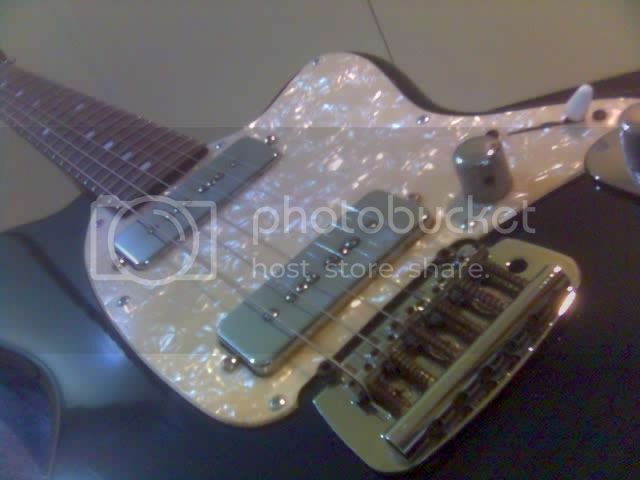 what kind of tremolo/bridge is that, mahogany body ba to? any mods? ano? Eric, did you do any mods on your Ibbys? Phil, walang baterya yon, passive EMG-HZ lang. Pero yung bass namin may active preamp around 6 mos inaabot ang battery, longer kapag Energizer. Yung pickups pinalitan ko kasi sinwerte lang ako sa ebay. Tapos nung nailagay ko na, napangitan na ako sa pole pieces ng mid pickup kaya bumili ako ng lace sensor. * Mahogany body and Maple top with Violin Flat finish. 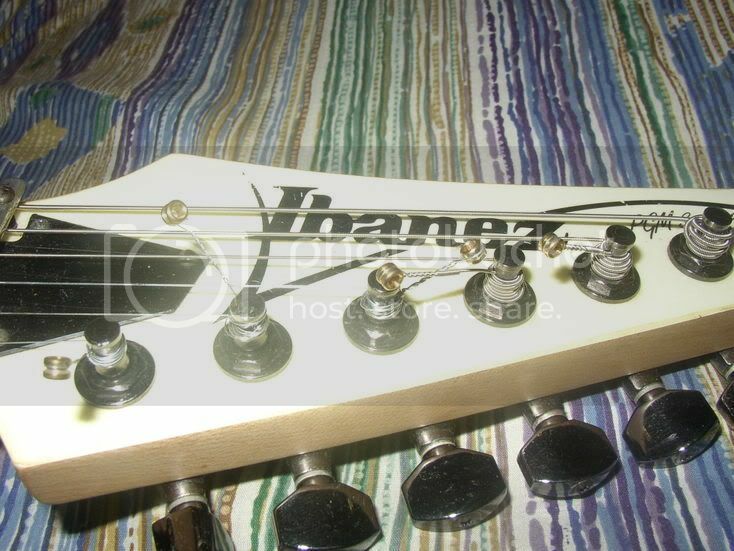 * Wizard Prestige neck and Gibraltar Plus Bridge. Mr. Kans... Paul Gilbert Model? Question to all you Ibanez fanatics. 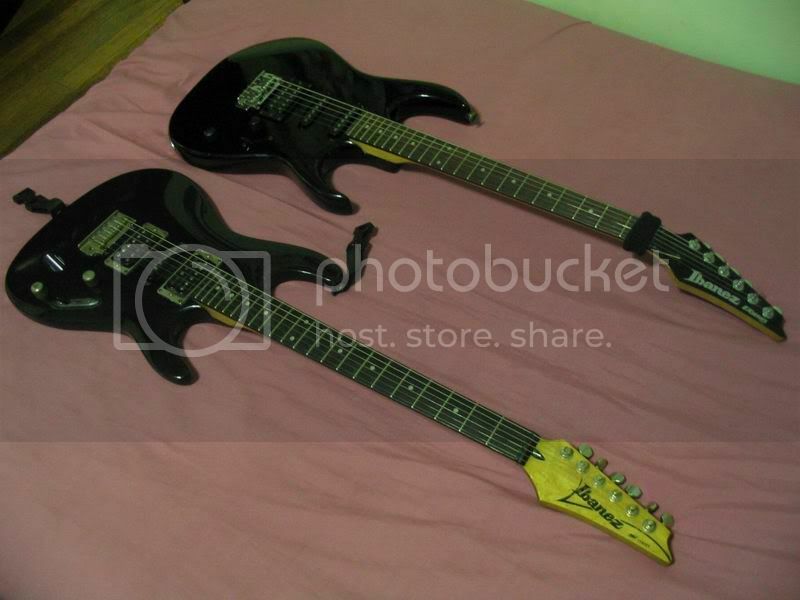 Did I not see a John Petrucci picture where he was holding an Ibanez US made neck through guitar or was I just imagining it? 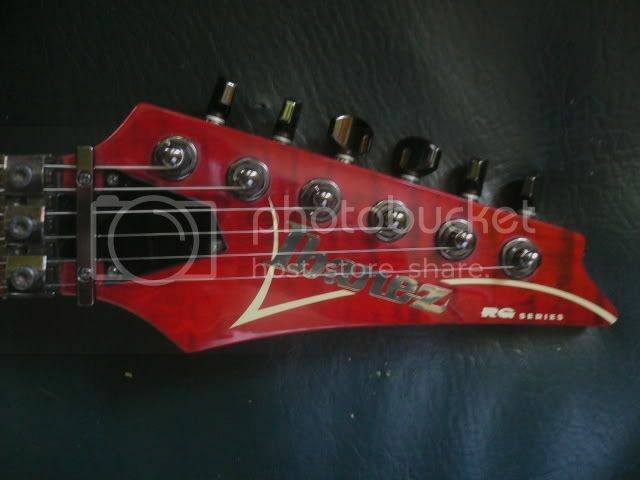 Are there still any US made Ibanez? I ask because my brother in-law has a SoundGear neck thru bass US made. I was wondering if they still make them anymore. 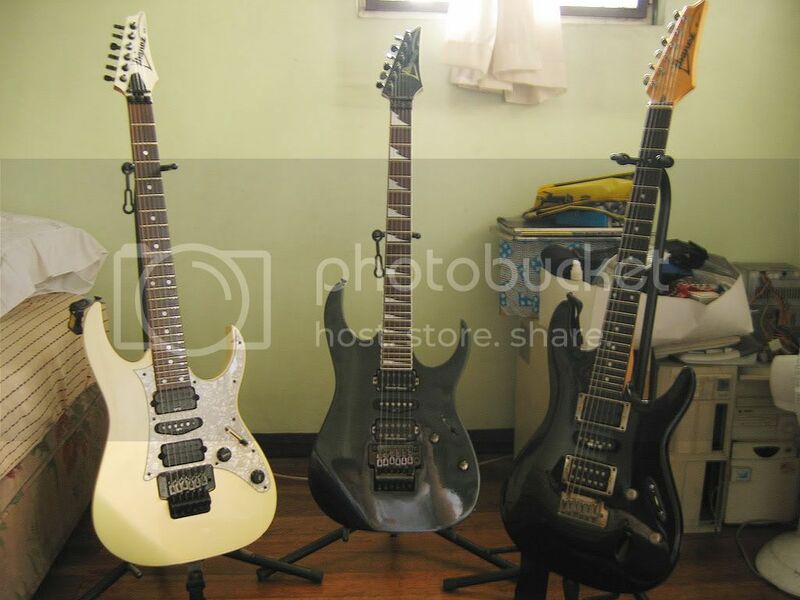 Yup stratman.. the only Ibanez guitar that I can't let go is my Ibanez PGM30 MIJ. ganda ng 550 mo bro.....any plans modding it? Hows the feel and sound? how bout the whammy?...been doing some whammy shubammy lately? thanks phil... On the way na Mod..bili ko yung evo, tonezone etc ni Sam sa yupangco...papaship ko dito...oo enjoy yung wangwang bar! stratman, cute nung knob no? glow in the dark neon yellow. pero tama ka rin, carrying a shred guitar takes a lot of responsibility, parang people seems to expect that you can shred...naku e di mas lalo na kung mga signature series! 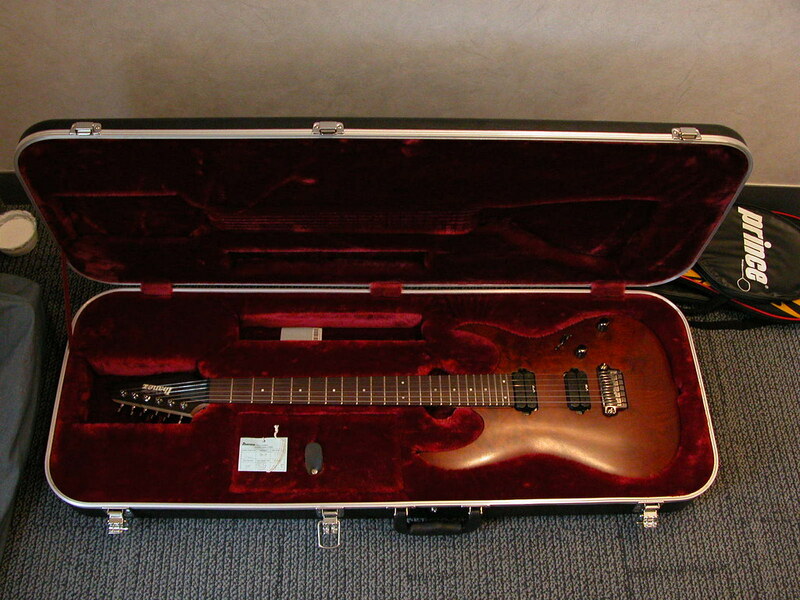 Ibanez RG7420. last stock sa buong pinas. tinago sa akin ng audiophile main for 4 long months! imagine that! 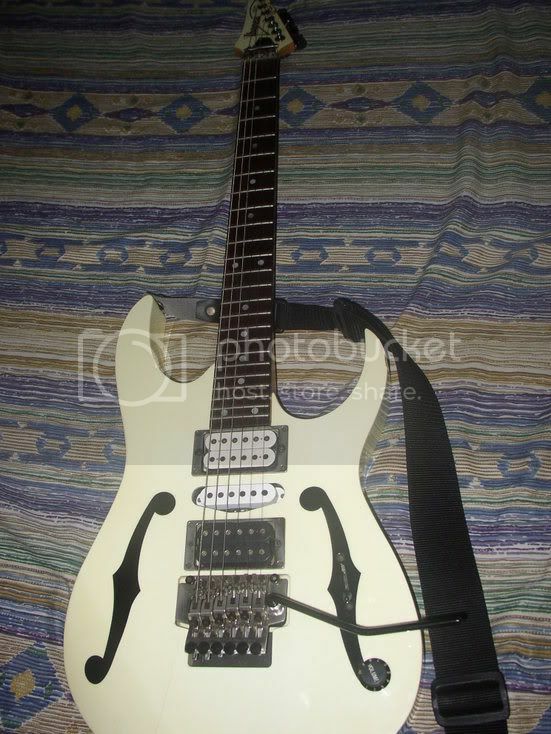 this baby is loaded with a seymour duncan invader 7, other than that, everything's stock. yung nakikita nyong parang bilog sa katawan, reflection ng ilaw yun. hehehe! this baby has been my workhorse since 2002. 47k selling price sa market my price is....secret +pickups na sd sir. opo sir, all stock lang yan. i'm planning to upgrade the electronics later pag nagka-budget na. 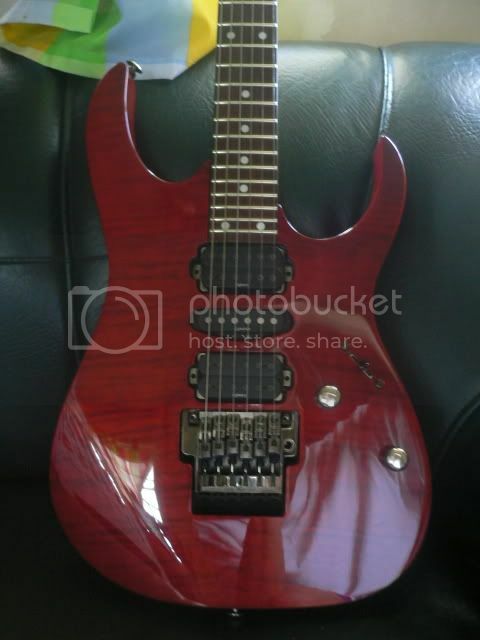 emg 60-81 o kaya dimarzio evolution neck-bridge. Ibanez still has a Custom Shop in LA for sponsored artists/endorsers. Amen to that! 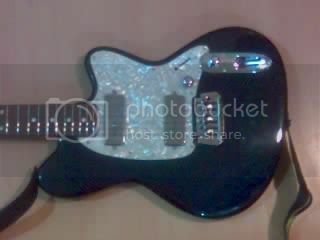 =D> Try ko sana yong Malmsteen model pero hindi tumutunog unless nag sweep-picking at million notes a minute, hehe. Ayaw ding tumunog kung Horse with No Name at rhythm songs, haha!!! Thanks Phil. Love this guitar to death! I havent seen a lot this around so i dint think twice getting it. 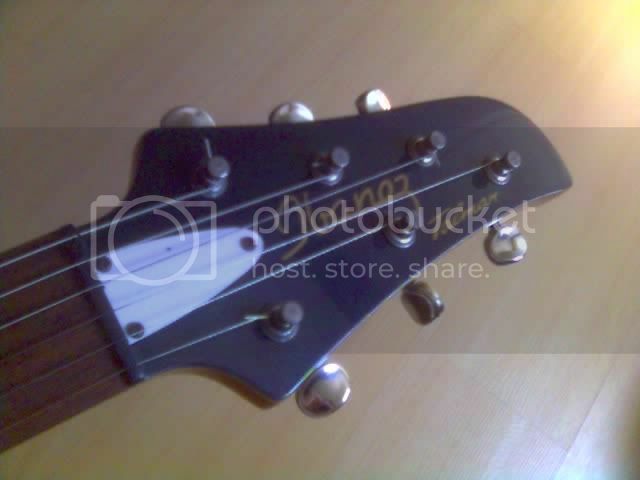 It has a really really nice jazzy tone on the middle and neck position. Had her for almost a month now. This aint a shredder's axe, but it sounds really good. Love 'em P90s! Bad Behavior has blocked 86047 access attempts in the last 7 days.